Come and join us on the Excellence for a beautiful sightseeing tour in Hamilton Harbour. We will cruise past millionaire’s row to show you the fantastic homes of the wealthy. After that, we will transport you to Paradise Lakes where you can swim and enjoy this gorgeous, well-kept secret of the locals. 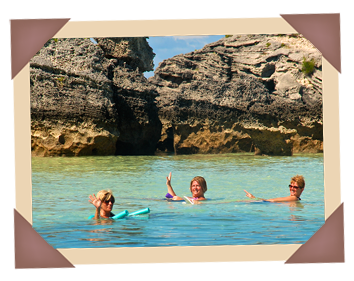 This area is a favourite here in Bermuda and you will truly think you are in Paradise while relaxing on your noodle in crystal clear waters. While on board you can enjoy Bermuda’s classic cocktails such as the Bermuda Rum Swizzle and the Dark and Stormy as well as ice cold beer, soda, water and snacks, all available from our cash bar. Also, sample our complimentary, locally made ginger bread!